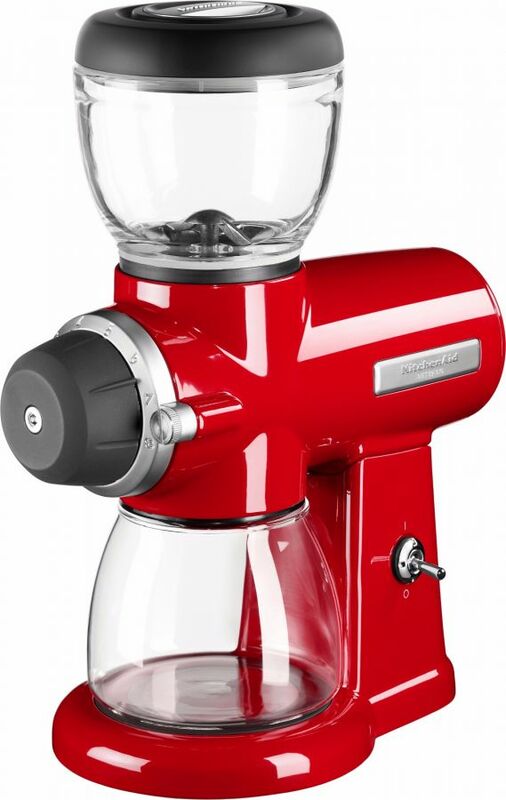 The KitchenAid Artisan Burr Coffee Grinder has a beatuful round design, The bodu is made of die-cast aluminum, and the bean hopper and container for ground coffee are made of glass. The coffee grinder gives a professional and robust impression. The KitchenAid Artisan coffee grinder has flat grinding burrs with a 57 mm diameter. This means that the burrs are large enough to allow for a lower RPM, which means less noise and that the coffee does not heat while grinding. The KitchenAid Artisan coffee grinder has 15 settings for the grind level for french press, pour over, drip coffee, espresso and anything in between. We recommend the grinder for all other uses except for espresso machines.